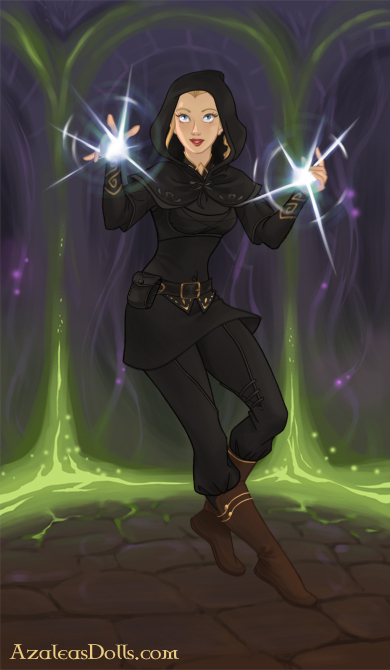 The countdown for Curse of Magic continues! Only a few short days and it will be in your hands–and I cannot wait to hear what you all think of it! It’s so fun to share the Timeless Fairy Tale world with you all! 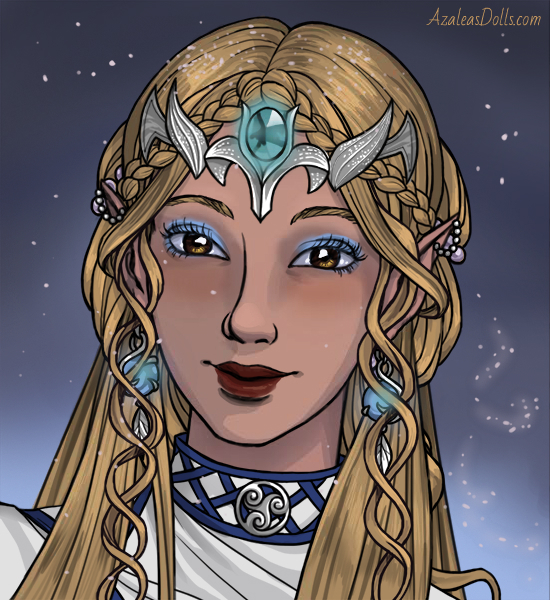 Keeping that in mind, I am so happy when readers like my characters enough to dedicate time to recreating them through drawing, painting, design or even costumes! 🙂 So I thought today we could celebrate with a post dedicated to the most recent pieces I’ve received. 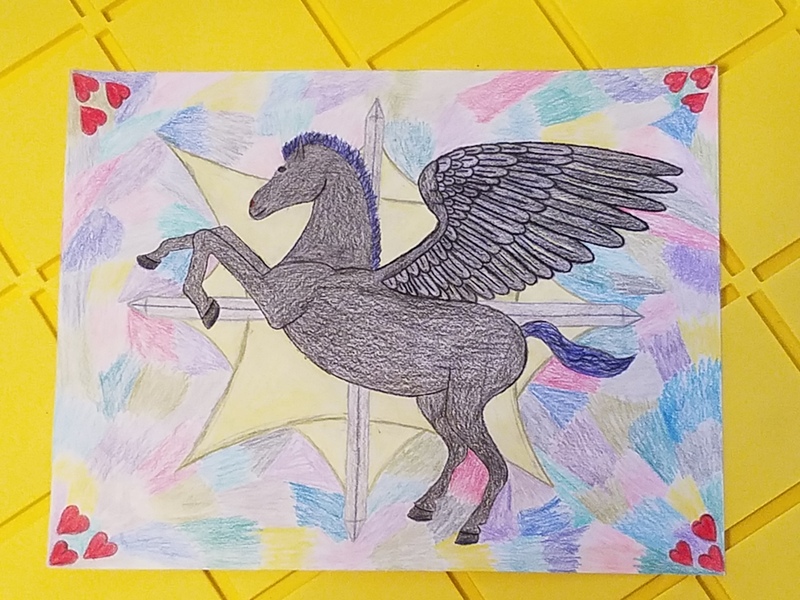 The has sharp, bladed star in honor Angelique’s magic with Pegasus over top, because he is her constant companion. I can tell she put a lot of effort into it, and all the thoughtfulness behind the symbolism is amazing! Thanks, Ashleigh! 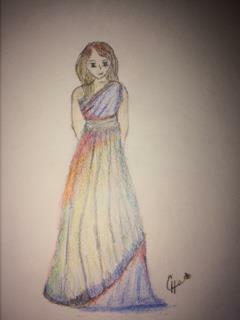 Here’s an artwork from Caitlyn that shows Angelique in her color changing dress! 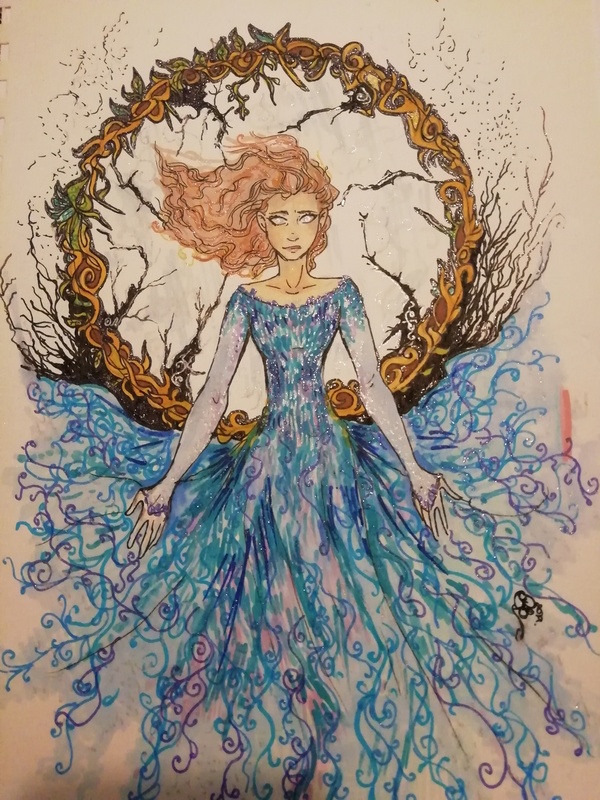 Angelique is described in this dress for most of the Timeless Fairy Tales series so it was fun to see it come to life in this drawing, and I’m really impressed with the way she Caitlyn colored it! (Seems to me like it would be an artist’s nightmare, but it looks so awesome! Aas a side note, you found out how Angelique receives this dress in Book 1 of Angelique’s series, and in Book 2 you’ll see how she first starts wearing it! 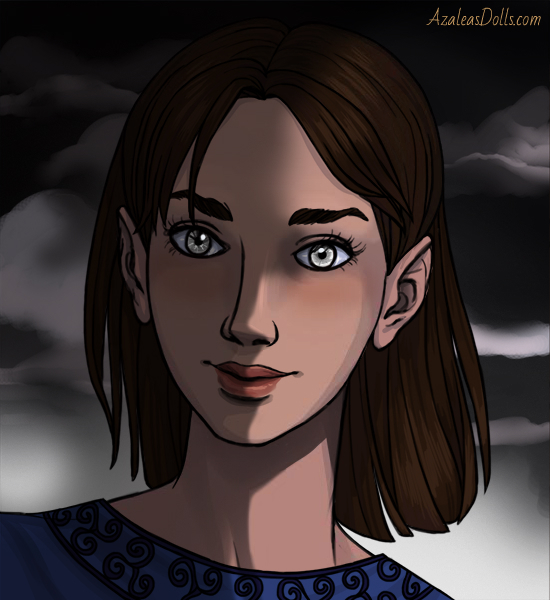 Here’s another image of Angelique by Rhapsody, and this is how Rhapsody pictures she would look destroying “the mirror”. She actually used glitter in this artwork which sadly doesn’t come through very well in the photo 🙁 but I love that she used glitter to make this already beautiful image even more powerful! I also love how beautiful and bad@$$ she made Angelique, it’s so gorgeous–and the intricacies on her dress–my goodness!! I received 3 different pieces from 4FANTASY, the first two are made using the Azaleas Dolls website and feature Yvrea and Tari from the Elves of Lessa series. 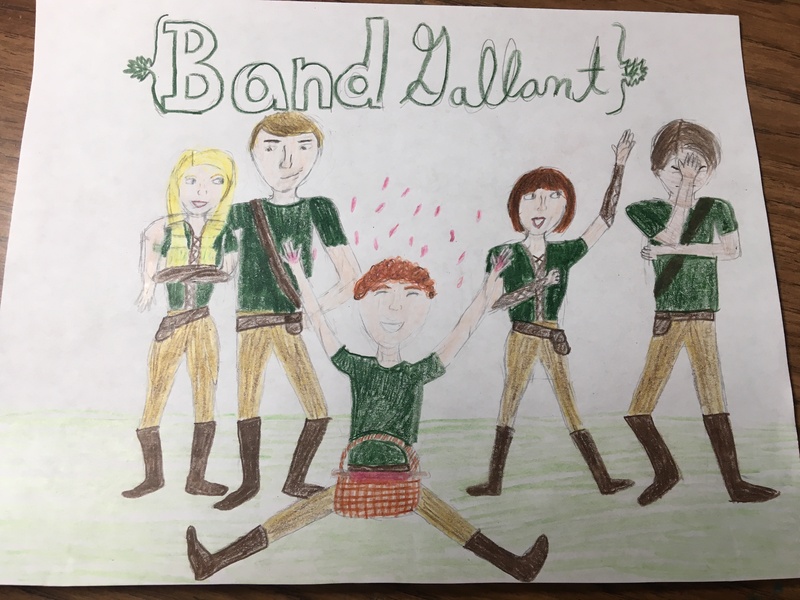 And the last image is a drawing she did of Band Gallant from the Twelves Dancing Princesses story. I’m so happy she did the Band Gallant artwork as this is my first artwork featuring any of them (other than Quinn)! The secondary characters don’t tend to get drawn as much as the main characters, which is understandable, but this group has a special place in my heart so I’m happy she captured them (and their personalities) on paper. Seriously, though, this is a perfect embodiment of their personalities. Guy, Leigh, and Kenneth made me laugh so, so, so hard at their very accurate portrayal, and I love their uniforms as well! Thanks 4FANTASY! That makes sense. Great job on the flag! Whoops, this was supposed to be a reply to Ashleigh and I just realized it wasn’t. I do not have a shred of artistic ability, so I thank those of you who do for sharing your talents. I too, love to see how others portray these beloved characters on paper and I think you guys do a great job. I know, I noticed that! Poor Bumpkin. Puss must be gloating.